Almora is a magnificent town with a long history. The Kashaya Hill on which the town is built finds amention in the scripture of the Skanda Purana. In 1560 Raja Kalyan Chand of Kumaon made it the capital of his kingdom. At that time it was called Rajapur and ancient inscriptions on many places still have Rajapur carved on them. The rule of the Chand dynasty came to an end after the gorkhas from Nepal occupied the area in 1790. The British defeated the Gorkhas in 1815, and established a small Army and a Cantonment. The Almora Bazaar is 1.5 Km. long covered with Kota stone slabs which have replaced the traditional hundred year old patals (old stone slabs). The streets of the bazaar are a delight to walk through. Houses and shops align the narrow streets that bustle with activity in the evenings. The traditional architecture is very much in evidence here as one spots carved doors and windows. Some of the best examples of the old styles of architecture can be found in Khazanchi Mohalla, an area which once belonged to the state treasurers. As you walk on the cobblestone path, the markets change from Lala Bazar at one end to Thana Bazar on the other. In between are Karkhana Bazar, Khajanchi Mohalla, Jauhari Mohalla, Malli Bazar and Tamta Mohalla. Tamta Mohalla is just short of the Cantonment. One of the traditional crafts of Almora is copperware and some of the best coppersmiths still work from their traditional area in Tamta Mohalla. As you walk through this area the air reverberates with the sound of wooden hammers on metal and one can spot the Tamta community at work carving exquisite brass utensils and decorative items. History of Almora can be traced back to ancient times of Mahabharata. However, the earliest historical account of the place is provided by a Chinese pilgrim of seventh century. The pilgrim wrote in great detail about a kingdom called ‘Brahmaputra’. A kingdom was first established in this area by the Katyuri dynasty. The Katyuri dynasty reigned from Dwarahat in katurya Valley. During those times, there was a small settlement in this are, not much of any political significance. King Baichaldeo of the Katyuri dynasty, who reined in the region where present day Almora is located, donated major part of this land to a Gujarati Brahmin by name Sri Chand Tiwari. In later times, during rule of Chand dynasty, Almora was founded around 1560 by Kalyanchand at this place which he called ‘Alam Nagar’. It was also called ‘Rajpur’. "Kaushiki Shalmali Madhyey Punyah Kashaya Parwatah Tasy Paschim Bhagam Kshetra Vishnyo Pratishthtam"
The name 'Rajpur' finds mention on numerous copper plates found in this area. An important reason for the Chand rulers to establish a settlement here was a number of natural spring water sources that this place harbors. Later, they even transferred there capital here. In 1744 during the raid by Ali Muhammad Khan Rohilla, Almora was taken over from Chand dynasty. However, unable to bear the hardships of living in the hills, the Rohillas chiefs, placed by Ali Mohammad Khan Rohilla, returned Almora for a heavy bribe of three lakh rupees. Ali Mohammad, dissatisfied with the conduct of his commanders, attacked Almora again in 1745. However, this time the Rohillas were defeated. They never came back again. In 1790, Almora was conquered by the Gurkhas who ruled it for the next 24 years until it was taken over by the British in 1815. Today, Almora is a primary center for trade and other activities – social, cultural, political- and is a district place of Uttarakhand State in India. Govind Vallabh Pant Public Museum near Almora bus stand is worth paying a visit owing to its rich collection of items relating to the history, archeology and cultural significance. The rich collection of this museum takes you on a journey of different phases of history of Almora. 'Apen' is a folk style of painting found in this region and can be seen here in this museum in its various aspects. This place could be your silent retreat to find yourself in the mountains. The place is famous for its view at sunrise and sunset. The place is unusually calm. It is said that the peacefulness of this place can not be matched with any other hill station. One can visit the circuit house nearby which also has a serene setting. For those in love with philosophy and spirituality, there is no better place. Nearby is Vivekananda Library in Ramakrishna Kutir. Swami Vivekananda had stayed here during the time he spent in Himalayas. It is a beautiful place 5 kms from Almora. The place enchants with its picture postcard view, miles of terrain with beautiful hills lined with pine and fur trees. Lying on the opposite side of the horseshoe ridge, Simtola is a quite picnic spot. While visiting Simtola, you can also pay a visit to the nearby Hiradungi which used to be a diamond mine and the beautiful 'Granite Hill' close by. Tamta Mohalla in the old city in earlier times belonged to the coppersmiths. Coppperware is still one of the popular crafts of Almora and the place is still inhabited by large number of coppersmiths. This is the old Almora fort located at the highest point of Almora bazaar. As you cross the Mall and the Almora bazaars, there is the Collectorate. Climb up here to get a view of the Almora and the nearby mountain ranges. It is a beautiful place just 10 kms from Almora. Complete with gardens and forests, the place has good scenic beauty. Many foreigners who came here liked the place so much that they settled here. A good picnic trip can be made here. 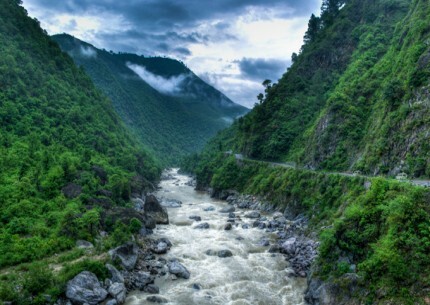 A place of unsurpassed beauty, Koshi lies 12 kms from Almora. A stay here can be arranged at the circuit house. Besides there is also Govind Vallabh Pant Research Institute here. The exact date when this temple was made is not known but it is believed to be hundreds of years old. People of this region and around have deep faith in this temple and it shows. Its the most famous temple around with thousands of pilgrims paying it a visit every year. Naina Devi was the patron goddess of Chandravanshi kings. This is the most famous place in Almora, it is as if old Almora lies preserved here. The temple stands in the antechamber of Shiva temple. Walls of the temple have been intricately carved attractively with true to life images. Nanda Devi Fair held here in the month of September draws large crowds. This is the sacred temple of Golu Devta, 6 Kilometres from Almora perched on a hilltop. Golu Devta was deified general of Chand dynasty that once ruled Almora. The temple has his shrine. Devotees, as thanksgiving offer bells here which are decorated on the canopy of these bells. Surrounded by fur and pine tree forest, a visit to this temple will prove beneficial for nature lovers. The temple bears strong faith among the locals here and goats are sacrificed here in front of the deity. To take a good view of Almora town, Kalimath is ideal, just 4.5 kilometres from Almora. There is also a temple of Kasar Devi here. Amazingly true, the temple dates back to second century. Next to the Konark temple of Orissa, Katarmal's sun temple is the most significant sun temple. This 800 year old temple has not received the kind of attention it deserves. Katarmal is 17 kilometres from Almora and worth paying a visit. Though the place is in ruins due to neglect but you will see some interesting architecture and intricate images carved out on walls. Thirty four kilometres from Almora is this famous temple of Jageshwar. This temple is counted among the 12 jyotirlings of the country. There are more than 100 large and smalls shrines in the complex, of them three shrines of Jageshwar, Mrityunjaya and Pushtidevi are notable for their sculptures. Jageshwar lies in a narrow valley surrounded by large deodars. 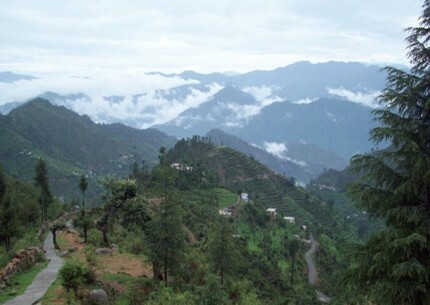 This place 47 kilometres from Almora is blessed by nature and is ideal for a day's excursions. There are also some natural caves and ancient temples of lord Shiva here for you to explore. A fair held here on Kartik Purnima. Ninety kilometres from Almora is the commercial hub of Kumaon region called Bageshwar. Located on the bank of river Saryu, the place gets its name from the temple of Lord Bagnath here. It is a 14th century temple and close to Pindari glacier. These two reasons are enough to attract visitors here. Baijnath is a historically significant place. 71 kilometres from Almora, this place has many 12th and 13th century temples built during Katyur dynasty. These temples of archaeological and historical importance are dedicated to Lord Shiva, Parvati and Ganesha. Located on the coast of Gomti river, those interested in historical architecture must visit them. Almora is a land of rich culture and tradition which has been well preserved and passed on from one generation to another. It is a land of fairs and festivals. Not a month passes without any fair or festival and people of Almora hold close to their hearts their religious values. Nanda Devi Festival is the most famous of all celebrated in the month of September. Celebrated with great joy here near Nanda Devi temple, a fair is also held during the same time. The magnitude of the festival can be realised by the fact that 25,000 people come to attend the festival. Another important festival celebrated around the place is Uttraini festival celebrated in January and a week long fair accompanies it. This is the most popular fair in the entire region. People from mountains and plains come here in this festival and fair organised in Bageshwar, 90 kms from Almora. Jageshwar monsoon festival is celebrated in the month of July and August. The festival is very significant from religious and historical point of view. Each day during the festival, approximately 1000 tourists pay visit to Jageshwar temple. Dushhera, the famous Hindu festival is another important festival here and is celebrated in a unique manner drawing large crowds from far and wide. Almora being so culturally active and rich has many many other fairs and festivals round the year. Pashmina shawls, woolen products like shawls, chutka, carpets and thulma are very popular here. One can also easily get products of ringal like musta and dalia. Apart from that in local art, you will get Kumaon Folk art, decorative candles, drift wood products like ekebanas, statues etc. Copper ware is also very famous here, the city's connection with coppersmiths dates centuries back. The charming Binsar hill-stations is situated in the Almora district of Uttarakhand. It is perched at an elevation of 2400 meters above the sea level, on the Jhandi Dhar hills and is one of the highest hill-station in the Kumaon region. On visiting this scenic place, tourist can feast their eyes with awe-inspiring views of the greater Himalayas, dotted with Alpine flora, ferns and varieties of wild flowers. Like most of the hill-stations in India, Binsar also has its glorious past. As per history, the hill station was the ancient capital of the Chand Raj Kings, who ruled over the region in the 7th and 3th centuries. A revered temple dedicated to Lord Shiva witness the bygone regime of King Kalyan. Apart from this, the hill-station is best known to be the home of wild flora and faunas. Binsar Wildlife Sanctuary is greatly visited by wildlife lovers from different parts of the globe. Dating back to the 16th century, Bineshwar Mahadev Temple is an important landmark and a must-visit place in Binsar. It was due to this temple that the region was named Binsar. King Kalyan Chand, one of the scions of the Chand Raja dynasty, is believed to have built this temple. The temple enshrines the deity of Lord Shiva. Apart from being a religious place, Bineshwar Mahadev Temple boasts of great architectural excellence. The temple can be an ideal stoppage point on the way to Binsar Wildlife Sanctuary. Nestled amidst the Himalayan range overlooking the Almora valley, Binsar is a beautiful, quiet and wild destination to explore in the Uttarakhand state of India. Binsar Wildlife Sanctuary was established in 1988, mainly for the conservation and protection of the shrinking broad leaf oak (Quercus) forests of the Central Himalayan region. An epitome of serenity and tranquility, the place extends tourists an unexploited and unruffled beauty. 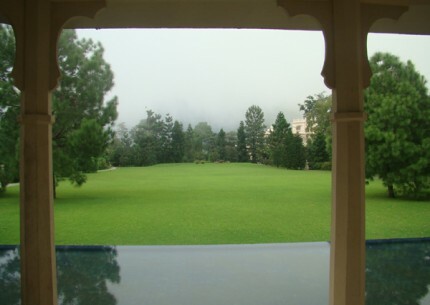 Set amidst the Binsar Sanctuary is the Khali Estate - a 26 acre of serene and beautiful land. The estate was once the home of Sir Henry Ramsay, the commissioner of Kumaon from 1856 to 1884. Khali Estate is an epitome of natural beauty and soothing silence. The charming view of the Himalayan range is beautifully coupled with the cooing of the birds. Apart from just resting in the estate, one can also indulge in long treks down to the little villages or up to the Binsar top. Historically, Binsar has been a great archeological site, thanks to the relics which date back to the Megalithic Age. Pariyadeva Pashan is one such relic, having long stone with cup-marks at the place. Situated on the Almora-Binsar road near Dinapani, it is a must see for tourists. So, if you were of the opinion that Binsar is nothing more other than mountain range and varied flora and fauna, this would surely come as a surprise. Binsar is located 152 kms away from Pantnagar Airport. Daily flights connects Pantnagar Airport with Delhi. Another nearby airport is Pant Nagar Airport, which is connected by motorable roads with Mukteshwar. Kathgodam Railway Station is situated 119 kms away from Binsar. Regular train connects the train station with major Indian cities like Delhi, Lucknow, Kolkata etc. Also, private cabs and local buses ply over from Kathgodam to Binsar and vice-versa. Places of interest abound in within close proximity of the Corbett National Park. These locales are chiefly renowned for the adventurous activities they offer, besides being an abode of nature and forming the habitat of wildlife vanishing species in India. Given below are some of the places of tourist interest in Corbett. The area in and around Bijrani once formed part of a shooting block. During the British period, it was much famed for the quality of game hunting that it offered to shikaris. In comparison to Dhikala, the terrain at Bijrani is drier and also has more diverse vegetation. Jhirna was a farming village until 1994 when it was successfully relocated under Project Tiger. The abandoned farmland is gradually reverting to a wild state and is being managed to develop grassland habitat. The nearby terrain consists of numerous sots and narrow gorges running typically through the Shiwalik landscape. The hills to the north of Jhirna are covered with dense patches of bamboo. Apart from being a good habitat for tiger, leopard and deer, the place hosts other interesting mammals like sloth bear and wild boar. The place is also ideal to enjoy a panoramic sight of some interesting birds in India. Dhikala is the most well known tourist destinations in Corbett. 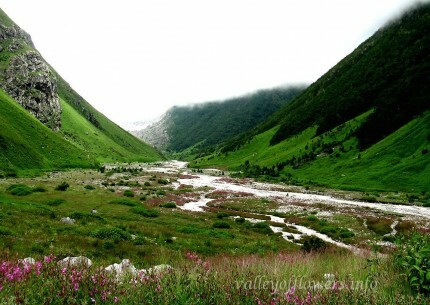 It is located at the edge of the broad Patli Dun valley through which the Ramganga flows in numerous channels. Dhikala offers an awesome unhindered view of the valley, with the Kanda ridge in the backdrop. Dhikala is the most well known tourist destinations in Corbett. It is located at the edge of the broad Patli Dun Sitavani is located about 35 km. from The The River View Retreat & The River View Retreat and within the reserve forest area of Ramnagar Forest Division. It boasts of beautiful dense forests of sal and mixed vegetation with open grasslands and riverbeds. The safari takes one to the ancient temple of Goddess Sita. According to a legend, this is the place where Goddess Sita disappeared into the earth. Sitavani is a part of Corbett buffer zone and there is a gated entrance but does not require any special permits to venture inside. The forest offers ample birding opportunities in the surrounding thick sal and mixed forest. Preferably early morning drive is the best to view wildlife like tiger, sambar, barking deer, porcupine, King cobra and lots more. Sitavani is well known to have visiting wild elephants and tiger all round the year as both the animals frequently visit river kosi for water and get across to raid the crops and lift the domestic animals from the village. 14 kms from Ramnagar, on the way to Ranikhet, is a huge rock in the midst of river Kosi. This place has been named Garjia Devi after the deity. The temple is visited by thousands of devotees from different parts of the state. A large fair is held here on Kartik Poornima. The Corbett Museum at Dhangarhi houses the belongings of Mr. Jim Corbett, with some of the animals at Corbett National Park. Durga Devi is a tourism zone within the Corbett National Park. 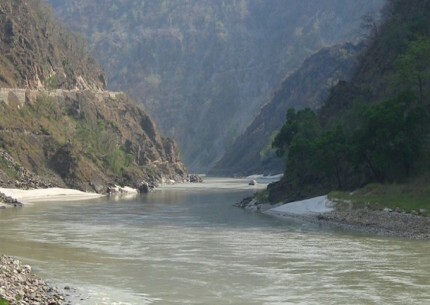 It is a virgin area used only for long elephant safaris and has access to the Ramganga River for the purpose of fishing. Leisure hotels has got the opportunity to have the first private lodge inside the park and will be providing angling facilities at the Jamun camp in the private untouched pool in the Ramganga river. This is on the north-eastern boundary of the Park. The entrance gate is about 20 Km away from Corbett Hideaway. The Mandal range of Corbett Tiger Reserve through Durgadevi entrance involve challenging birding species to lookout for include the grey headed fishing eagle, crested laughing thrush, black chinned Yuhina, maroon orile, slaty blue flycatcher, long tailed broadbill, little forktail, and bar tailed tree creeper. Lohachaur forest area is known for wild elephants all round the year and the undulating terrain provides excellent opportunity to see the leopards as well as tigers. The nearest international airport is in Delhi at a distance of 300 kilometers from Corbett National Park. The nearest railway station is at Ramnagar. Moradabad is the nearest major railhead form where trains to various major cities can be boarded. Tourists looking to travel by road can avail of the semi deluxe services operated by the Delhi Transport Corporation. The other options include private buses and taxis from Delhi, Nainital and Ranikhet to Ramnagar. Haridwar stands as the gateway to the four pilgrimages of Uttranchal. Geographically and geological, Haridwar, lying at the feet of Shiva's hills, i.e., Shivaliks, in the Haridwar district of Uttranchal Pradesh, is a doorway. " According to Hindu mythology Haridwar was known as Kapilsthan. Legend has it that the ancestors of Raja Bhagirath, were consumed by fire at this spot following a curse of Rishi Kapil. For their salvation Raja Bhagirath requested the Ganga to descend on Earth. Haridwar is also famous by the names of Gangadwar Mokshadwar, Tapovan and Mayapuri. It is at Haridwar that the Ganga finally emerges into the northern plains. Haridwar has earned fame as being the place which has been blessed by the trinity of Lord Shiva, Vishnu and Brahma. It is also one of the major Shaktipeeths. People prefer taking bath on the numerous ghats built on the river shores. It is said that taking bath here purifies the soul and opens the way for the ultimate freedom, Nirvana. Down the ages, Haridwar has purified the mind, the body and the soul. Not only in spiritual or religious terms Haridwar has come up as a major learning center for arts, science and culture. This most sacred Ghat was built by King Vikramaditya in memory of his brother Bhatrihari, who is said to have meditated on the banks of Ganga in Haridwar. It is also known as Brahamakund and is the site for the famous Kumbh Mela. Large number of devotees take a holy dip in Ganga over here. The evening Ganga Aarti provides a truly enchanting experience as large lumber of ornate oil lamps (diyas) with dozens of flames burning in pure ghee are offered to Mother Ganga accompanied with devotional songs and prayers. A temple on the river bank here is said to have an imprint of Lord Hari's footprint. It affords a panoramic view of the ghats and Ganga canal. The ancient temple is dedicated to Goddess Maya Devi, the Adhisthatri deity of Haridwar. It is regarded as one of the Siddhapeethas and according to mythology the heart and navel of Goddess Sati had fallen over here. It is perched atop the Bilwa Parwat and can be reached by a rope-way with its brightly coloured cable cars or on foot. A statue of the Goddess here has three mouths and five arms, while the other one has eight arms. The temple commands a fine view of Haridwar. This ancient Shiva (Mahadev) temple is located in the south Kankhal town. The mythological legends state that King Daksha Prajapati, the father of Sati (Lord Shiva's consort) performed a yagya here, but didn't invite Lord Shiva. Sati was offended by her father's behaviour and sacrificed her life by jumping into the fire of yagya. Infuriated Lord Shiva killed King Daksha, but later brought him back to life. It is set atop Neel Parvat on the banks of Ganga. The shrine was built by Suchat Singh, the king of Kashmir in 1929, but the main statue is said to be established by the Adi Shankaracharya in 8th century. According to a legend Goddess Chandi killed demons Chanda - Munda, the army chief of demon kings Shumbh Nisnumbha here. The temple is 3 kms trek from Chandighat. The legendary site is said to be the place where Saptarshis (seven sages) meditated and river Ganga, not wanting to disturb them split herself into seven streams (Sapt Sarovar) around them. This old centre of herbal medicine and traditional studies is located on the Haridwar-Jwalapur bypass road. The Ved Mandir Museum here exhibits archaeological exhibits. Kanva Rishi Ashram; Bilkeshwar Mahadev; Pawan Oham; Bhooma Niketan; Vaishnav Oevi Temple; Doodhadhari Temple; Shahi Gurudwara; Jairam Ashram. The park endowed with pristine beauty and rich bio-diversity covers an area of 820 sq. kms on the edge of the Doon Valley about 10 kms from Haridwar. It was established in 1996 and has over 23 species of mammals and 315 avifauna species. It is a safe haven for elephant, tiger, panther, bear, chital, sambar, wild boar, barking deer, python, monitor lizard etc. Elephants are available for wildlife viewing at Chilla and Dholkand. It is 23 kms south of Haridwar, on the outskirts of Roorkee, an important educational centre. The 'Dargah' of Hazrat Makhdum Allauddin Ali Ahmed Shah 'Sabir' here is a shining example of communal harmony and peace. It is believed that the wishes of the devout are fulfiled here and large number of devotees from all faiths and religions visit the dargah from all over the world. The annual Urs is celebrated from 1 st day of sighting the moon to 16th day of Rabeeull month Islamic calender. Connected with major cities of India- Mumbai, Delhi, Kolkata, Agra, Varanasi, Allahabad, Ujjain, Amritser, Dehradun, Lucknow, etc. Kausani is a destination for Himalayan tourists. 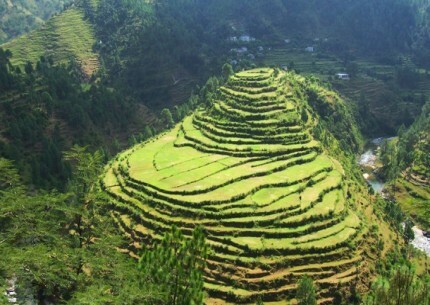 It is located 53 km North of Almora. The altitude of this place is about 1890 mts. This place offers a 350 km view of the Himalayan peaks like Trisul, Nanda Devi and Panchchuli. There are very few places in the Himalayas which can compare with the beauty of Kausani - a picturesque hill station famous for its scenic splendor and its spectacular 300 km-wide panoramic view of the Himalayas. Kausani lies on the atop the ridge admist dense Pine trees overlooking Someshwar valley on one side and Garur and Baijnath Katyuri valley on the other on Almora-Bageshwar-Didihat Highway. Mahatma Gandhi called Kausani the 'Switzerland of India', due to similarity in landscape.Another attraction named Anashakti Ashram lies at Kausani. It is a quiet and revered place where Mahatma Gandhi spent his some days and wrote his commentary of Anashkti Yog. Pant Museum is another place of importance; this is the place where the famous poet of Hindi literature, Sumitranandan Pant was born. This place is preserved in its original ancestral form and served as a reference library on him. Lakshmi Ashram is a km away from the Kausani, and is a center run by Kumauni women and dedicated for social service and upliftment of women. Gandhiji's disciple, Sarlaben (Kaitherine Heileman) spent her life here doing social service and established Anashakti Ashram. Lakshmi ashram is located in a solitary area among dense pine forest. Tea gardens (5 km on Bageshwar Road). This ashram was founded in 1964 by Catherine Hillman, a disciple of Gandhi who further came to be known as Sarlaben .In the Ashram Several skills like growing vegetables, cooking, caring for the animals and cleaning are taught to over 70 orphaned poor girls and woman who live in the ashram. Lakshmi ashram is located in a quiet place up the hills which lends a serene atmosphere to the ashram. Another important attraction in Kausani is the birth place of famous Poet Sumitra Nandan Pant. A Gallery built in memory of the famous Hindi poet is in Kausani The gallery houses hundred of English and Hindi books in glass cabinets. A poetry symposium is organized here every year to mark the poet’s birth anniversary.Baijnath : A 12th century temple on the banks of Gomti River. The ancient temple of Mahadev is just 16 Km. from Kausani and 22 Km from Bageshwar, at a height of 1,125 meters These temple include Lord Shiva, Ganesh and Parvati, Chandika, kuber, Surya, Brahma, and Mahisa Sur-Mardini which portrays the slaying of the bull-headed deon by goddess, Kali, Baijnath Temples are constructed of stone. The temple complex exhibits the amazing architecture of the age. The main temple that houses the beautiful idol of Parvati is chiseled in black stone. According to Hindu mythology, Lord Shiva and Parvati were married at the confluence of River Gomati and Garur Ganga. The temple is situated about half way up the hill above the village. 5 Km from Kausani The first is a small conical structure, 2.5 to 3 meters high, dedicated to Bhairon. The main temple is close to this on the north, a squre, slated structure, with the door facing the south, and figures of rajas, etc., sculptured on the walls.The famous fair celebrated every year in October. 42 Km from kausani, Bageshwar has its patriotic expressions and picturesque interludes. Situated on the confluence of Gomti and Surya rivers . The Temples of Bagnath situated here is venerated by one and all.During the reign of the Chands, the Shiva temple was constructed at Bageshwar. The Pindari Glacier, in the Bageshwar district, falls in the Kumaon Himalayas This world famous glacier is a trekker's paradise, as it is easier to visit than most other glaciers. This glacier is situated between the snow capped Nanda Devi and Nanda Kot mountains. The glacier is at an altitute of 3353 mts. A little away from the Kausani bus stand is a museum named after the Hindi poet Sumitranandan Pant. The house which has the museum is the poet's house of his childhood days. His daily use articles, drafts of his poems, letters, his awards etc. are displayed here. This place is a center run by women who do social service. Gandhiji's disciple, Sarala Behen spent her life here doing social service. This ashram is located in a solitary area in a dense jungle. scenic beauty at a distance of 15 Km from kausani,Famous Shiva temple which was built by King Somchand of the Chand Dynasty. In March every year a festival is held here . 75 kms away from Kausani and is well known for the majestic view shining against the sky making the horizon as seen from chaukori.The glory of the snow crowned Himalayan range reaches its pinnacle when the sunrays turn them into crimson and gold.it gives the view of the Himalayan peaks from chaukori. Mukteshwar is a small town, and one of the most-sought tourist destinations, in the Kuma on hills of Uttarakhand. It is situated at an altitude of 7,500 ft above sea level and is famous for the wonderful 180-degree view of the captivating snow capped mountain ranges that it provides. The second highest mountain-peak of India, Nanda Devi, is also visible from Mukteshwar. The other ranges one can see from Mukteshwar are Neelkantha (Blue-throated Shiva), Trishul (Shiva’s Trident), Nanadaghunti (the Veil of the Goddess), and the Panchuli Group. Apart from the scenic vistas of mountain ranges it provides, Mukteswar is also famous for its beautiful orchards, dense coniferous forests and old colonial bungalows. One of the most famous attractions of this place is the Shiva Temple, known as ‘Mukteshwar Dham’, after which the entire region was named Mukteshwar. A 350-year-old temple, it is situated at the highest point in Mukteshwar. The temple consists of a beautiful white marble Shiva lingam. Other than this, one can also visit Chauli-ki-Jali, a site marked by mountain-rocks that project out from the hill at a bizarre angle. Chauli-ki-Jali also provides opportunities for rock climbing and rappelling. It promises to offer astonishing views of many scavenger birds, pouncing down on their praise, as well. According to the local belief, the wishes made here are certainly fulfilled. When in Mukteshwar, you can also visit the sunrise point at PWD guest house and have a mesmerizing experience of dawn. People interested in science and technologies have two more places to visit in Mukteshwar, the Indian Veterinary Research Institute and ‘Renewable Park’, developed by Energy and Research Institute of India. One of the sacred places to visit in the area is the Mukteshwar temple. Dedicated to lord Shiva, it is a legendary pilgrimage and Mukteshwar has acquired its name from the name of the temple. It is situated at the top of a hill and can be reached by climbing a series of steep stone stairs. For those who are deeply religious, trekking to the temple can be a heavenly experience, in part because of the natural splendor of the place. The temple is adorned with a marble Shivling and idols of some other Hindu deities. It is a historical place which is also called Chauli Ki Jali by the locals and is situated adjacent to the Mukteshwar temple. Mythology believes that a demon and a goddess had fought a battle in this place and bleak outlines in the place are to be seen which resemble a shield and the trunk of an elephant which are testimonials of the battle. Legend also has it the barren women who came here and touched the lattice around the rock were blessed with a child. A British legacy, Indian Veterinary Institute is one of the leading advanced research facilities engaging in live stock research and is dedicated to the development of the region. It was established at the Imperial Bacteriological Laboratory in 1889 at Pune on the recommendation of the Cattle Plague Commission, and was later relocated to Mukteshwar in 1893. Further, it was developed into the Indian Veterinary research Institute. There is a library and museum as well inside the institute campus. The PWD inspection Bungalow in Mukteshwar is an architectural wonder. It is situated close to the Mukteshwar temple and is a landmark in the town. The bungalow has lush green surroundings and beautiful views which makes it a must-see in the hill station. In fact, it is the perfect place to stay in Mukteshwar if you are halting for a couple of days. Blessed with amazing natural beauty and beautiful architecture, the bungalow has a unique charm. Mukteshwar is famous for trekking trips as it makes for the perfect combination of adventure and fun. Some of the trekking trails are Peora to Mukteswar (8kms), Peora to Almora (16 kms), riverside trek (6 kms) and Binsar to Artola Trek (73 kms). Trekkers can also chart some new trekking paths if they wish to explore the unknown. Don’t forget to put on your trekking shoes and make minimum noise while you trek, so as not to disturb the nature. Mukteshwar is the ideal destination for those who want to connect with the nature and absorb its soothing beauty. While it provides for some amazing sightseeing, quite walks in the natural environs have an enticing charm of their own. Nature walks are the best way to rejuvenate your mind and feel afresh. One can go for a long walk in the evening. Early morning nature walks can be the very pleasant to delight in the morning freshness and admire the matchless beauty of the mighty Himalayas. Rappelling in Mukteshwar can be a fabulous experience. A lot of tourists visit Mukteshwar for the purpose of engaging in rock climbing and rappelling. This can also be coupled with forest picnics or camping to double the fun. Take the necessary equipments along and ensure that you are taking proper protection against danger. Seek the help of professional instructors, if you have not done rappelling before. The Indian Veterinary Research Institute in Mukteshwar is a legacy of the British reign in India. It is one of the premier institutes in India conducting research on livestock. The tourists can also check out the library and museum inside the institute. There is a PWD inspection bungalow in Mukteshwar which is known for its colonial architecture and is landmark in the hilly town. Visitors can put up in the Bungalow for a day or two for a complete experience. The nearest airport to Mukteshwar is the Pantnagar Airport, located at a distance of 111 km. Pre-paid taxi services charge around Rs 1700 to drop you till Mukteshwar from the airport. Daily flights connect Pantnagar to Delhi, which is also the nearest international airport from Mukteshwar, connecting it to most of the cities in India as well as abroad. The nearest railway station from Mukteshwar is Kathgodam, which is at a distance of 73 km. Kathgodam is well connected to other major Indian cities of India, by regular trains. After getting down at the station, you can either take a bus or a taxi to reach the scenic hill station of Mukteshwar. Mukteshwar is at a distance of 353 km from Delhi, 51 km from Nainital and 42 km from Haldwani. State run bus services connect the other cities of Uttarakhand, such as Kathgodam, with Mukteshwar. Privately-owned luxury buses also run on Delhi-Kathgodam route. Buses can be taken from the Delhi's ISBT Anand Vihar terminal. It takes 8 hrs to reach Kathgodam from Delhi, by road. From Delhi, the route to follow is the one from NH 24 to Rampur and then NH 87 to Ranibagh. From there, take the state highway to Bhowali and then another state highway will take you to Mukteshwar, via Ramgarh. Popularly known as the Queen of Hills, this charming hill station, 34 kms from Dehradun is situated at an altitude of 2003 mts in the Garhwal hills. above sea-level. Mussoorie is one the beautiful hill stations in India and the most frequently visited. It provides excellent respite to people who want relief from the hot sultry conditions of the plains, especially since it is close enough to the capital to make just weekend trip. Also, major Hindu pilgrimage sites like Kedarnath, Badrinath, Gangotri, Yamunotri, Haridwar, Rishikesh are not far from this place. 6 kms The Park Estate of sir George Everest, First Surveyor General of India, Who had his offce and residence here, is approachable by road. The highest peak in the world, Mount Everest, is named after him. Benog Hill9 kms 6to the west of Mussoorie and at an altitude of 2104 mtrs. Is the Jwalaji Temple. It is situated on the top of the Benog Hill and has an idol of Mata Durga in it. The temple is surrounded by thick forests and offers a panoramic view of the Himalayan peaks, Doon valley and Yamuna valley. About 55 km, an ideal spot for trekking. Naga Tibba is the highest peak around Mussoorie at 10,000 feet and is covered by thick forests. On Mussoorie-Tehri Road 25km away, it has deodhar forests and mountainscapes. Surkhanda Devi Temple at 10,000 feet, 35 km down the Mussoorie - Tehri road. Perched on a peak, the temple demands a stiff two-km climb form devotees. The temple, goes the legend, was built on the site where the head of Shiva's consort (Shiva is the destroyer in the Hindu trinity) fell after it was chopped off to stop Shiva's terrifying dance of death that was shaking the universe to its very core. 80km away on the Mussoorie-Yamunotri Road. Linked with the Mahabharata with idols of archaeological importance. Dehradun is the nearest railway station to Mussoorie. The first recorded discovery of this now popular hill station of Nainital, was in 1841 when a British, Mr. Barron, chanced upon the lake. Moved by the scenic beauty of the lake and thickly forested hills, he constructed a house named Pilgrim’s Cottage. It was the first of many residences, which were to transform Nainital into a popular resort. By 1858, Nainital became a well-known hill station, and within a few years the summer seat of the provincial government. According to local belief the origin of Nainital harks back to mythological times. Sati, Lord Shiva’s consort committed suicide at the yajna of Daksha Prajapati. When Lord Shiva roamed across the universe carrying her dead body, Sati’s eye fell near the lake, where the Naina Devi temple now stands. The waters of the lake are therefore considered sacred and the Naina Devi temple is the venue of an autumnal fair. In ancient times, the lake was know as the Tri-rishi Sarovar, the lake of three rishis-Atri, Pulastya and Pulaha. Prior to 1839, the valley was covered by thick forests and inhabited by hill tribesmen. A major landslide in 1880 led to the formation of the flats, the level ground by the lake, where a variety of entertainment awaits the traveler. Nainital’s attractions range from quiet walks in meadows the forests of pine and deciduous, the adventure sports as well as popular entertainment. This hill resort can be enjoyed at any time of the year. Nainital is referred to in the ‘Manas Khand’ of the ‘Skanda Purana’ as the Tri-Rishi-Sarovar, the lake of the three sages, Atri, Pulastya and Pulaha who were reputed to have arrived here on a penitential piligrimage and finding no water to quench their thirst dug a hole and siphoned water into it from Mansarovar the sacred lake in Tibet. The Second important mythological reference to Nainital is as one of 64 ‘Shakti Peeths’. These centres were created wherever parts of charred body of Sati fell, when Lord Shiva was carrying around her corpse in grief. It is said that the left eye (Nain) of Sati fell here and this gave rise to patron deity of town Nainital. It is said that the lake is formed in the emerald eye shape. Naina Devi temple is located at the northern end of the lake. Thus name of Nainital derivated from Naina and the tal (Lake). 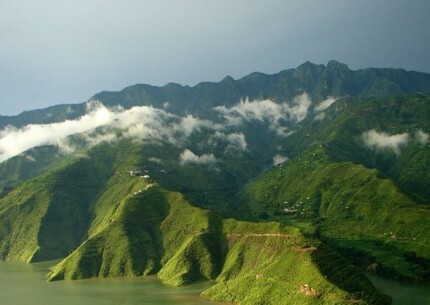 Nakuchia Tal is a lake in Nainital, known for having nine corners. This lake is still untouched by majority of the tourist population and owing to this, has managed to maintain its serenity till date. Take a walk around the nine cornered lake to enjoy the beautiful natural setting. Otherwise, you can also go on a boating tour and explore the scenic surroundings. Situated 22 km from the city center, Bhimtal Lake is the biggest lake of Nainital. It is named after one of the Pandav brothers Bhim. The lake boasts of an island within its precincts, which is home to a very famous temple. During the day, one can easily hear the chiming of temple bells, even from the embankment. Overlooking the Naini Lake, Naina peak (2611mt) provides the most breathtaking view of the hill station of Nainital. Situated at a distance of about 6 km from the main town, Naina peak is the highest peak of the hill station. Horses or ponies can be hired from Snow View Point or Mallital, if one intends to visit the peak. Naina peak is also referred to as the China peak and is an absolute delight for trekking lovers. It is around 3.5 Kms away from the bus stop at an altitude of 1951 Mts. Hanuman Garhi is a religious centre and famous for its sun set view .One can go to Hanuman Garhi by taxi, bus or even on foot from Nainital .It has a temple complex presiding deity being Lord Hanuman besides Ram and Shiva. At the instance of Neem Karoli Baba around 1950 these temples were built. On the other side of the hill there is Shitala Devi temple and Ashram of Lila Sah Bapu. It is one of the main attractions of Nainital. This ropeway connects Snow-View Point (at 2270 Mts.) with Nainital near flats. Aerial ropeway starts at Mallital , there are two trolleys to carry passengers .It takes approx. 151.7 seconds to cover one way journey by trolley .Cabin capacity is 10+1 or 825 kg.Timings 10 AM to 4 PM. At an altitude of 2194 mts. and 10 Kms. from the town this place is accessible by a motor able road. There is a forest rest house for night stay.Kilbury is an ideal spot for a quiet and peaceful holiday. Around one Km. away from bus stand at an altitude of 2100 meters in sprawling open area there is Govind Ballabh Pant High Altitude Zoo . Now a days it has Monkeys, Himalayan black bear ,Leopard ,Siberian Tiger,Palm civet cat, Wolf, Silver Pheasants, Rose ringed Prakeet, Hill Fox , Ghoral, Barking Deer, Sambhar. The zoo remains closed for visitors on Monday, all national holidays , Holi & Diwali. Also called Dorothy's seat, this place is a terraced mount peak, located on Ayarpatta hill at 2292 m altitude. This place is a memorial built for the English artist, Dorothy Kellet, by her husband and her admirers after she passed away in a plane crash. The place is a 4-km hike from the town and offers the most excellent sights of the nearest countryside. Pantnagar airport is situated at a distance of 71 km away from Nainital. This is connected to Delhi International airport. Taxi services are available from airport to Nainital costing about Rs 1500. Delhi is the nearest international airport (350 km), which is well connected with other cities in India and abroad. Kathgodam is the nearest railway station, which is 35 km away from Nainital. Lucknow, Agra and Bareilly are directly connected with Kathgodam by rail. Taxi fare from Kathgodam to Nainital is about Rs 600. Nainital is well connected to other cities by state public transport buses. Deluxe and semi deluxe luxury buses ply from Delhi (350 km), Almora (70 km), Ranikhet (60 km) and Badrinath (340 km). The bus charge varies between Rs 3 to Rs 4 per km. Ranikhet is a quaint little hill station conceived by the British tucked away in the Kumaon Himalayas. Charmingly un -spoilt natural beauty... Serene and quiet… It is the place, which wonderfully mirrors best of the heavenly Himalayas; their lush green forest, magestic mountains, delicate and attractive plant life. To view nature and its elements in full harmony the right place to be is Ranikhet. The scented, fresh and pure mountain breeze, the singing birds, the panoramic view of Himalayas the sight sound and smell leave the onlooker spell bound, during the rain, flowers sprout up everywhere in rainbow colors, branches of tree sprout up with ripened fruits and sun light peeping through the mist and clouds endow an enchanting effect all across the Ranikhet. As winters come, the softly falling snowflakes cover the environment in sheet of pure whiteness. The charm of every season is irresistible in its own right. And this is what makes Ranikhet an all season destination. It is a hill station where the mall road still has no shops. Old and mighty Deodar trees still bound the meandering stretch of the mall road. One can still hear the perching of birds and wild animals while on morning or evening walk on this stretch. According to the popular belief this place had won the heart of Rani Padmini, queen of Kumaon. She chose this scenic place to be her abode and since then it has come to be known as Ranikhet, literally QUEENS FIELD. The gallantry Kumaon regiment is present almost everywhere in Ranikhet, making it a very safe, peaceful and very clean place to visit and live. Those who look for a home on hill station, Ranikhet is the answer. From recreation to emergency support, it has everything to take care of those who make this beautiful place their home. It has a helipad, a multi specialty hospital, specialist like cardiologist, surgeons, pediatrician, physician etc. are available in Ranikhet for the emergency support. Ranikhet has a 9 hole Golf Course owned and maintained by the Kumaon Regiment Centre but open for civilians also. This hill town has not yet become a crowded weekend getaway because of its distance and driving time (approx 8 hours) and that’s one reason it still attracts those who want to live peacefully and in a pure and fresh environ. Ages ago, a Kumaoni queen, Rani Padmini fell so deeply in love with the green glades and meadows of a tiny hill paradise that her king, Raja Sukherdev, built her a grand palace there and named the place as Ranikhet or queen’s meadow. There is no trace of a palace to lend credence to this legend, but few who have visited Ranikhet have any doubts about its charm. In 1869, the land was bought from local villagers and the British established a summer resort and recreation settlement for their troops, and a cantonment town governed by the military authorities. They also developed a hill station here. At one time, Lord Mayo, Viceroy of India, was so enchanted with the place that he wanted to move the summer Headquarters of the army away from Shimla. That did not happen but Ranikhet became and still is the Regimental Centre or the Kumaon Regiment. Chaubatia means the place where four roads meet. Chaubatia is situated about 10 km to the south of Ranikhet. Chaubatia was originally a sanatorium for British troops, but it now houses the Government Fruit Garden and Research Station which grows 200 varieties of fruit. The Himalayan peaks can be seen very close from Chaubatia. A 3 km walk from Chaubatia leads to the artificial lake of Bhaludam. Upat is situated about 6 km from Sadar Bazaar on Almora Road. Upat is the site of one of the highest golf course, with views of the Great Himalayas. Upat offers golfing at high altitudes, where a high-powered shot can land far, far below in the valley. The visitors can have a game of golf at the Army Golf Course in Upat. An old temple dedicated to goddess Kali lies just a kilometer away from Upat, at Kalika. Bhalu Dam is an artificial lake on the Kosi River, about 3.2 km away from Ranikhet. This dam supplies Ranikhet with its water and is popular for fishing. The Cooperative Drug Factory is known for the production and research of Ayurvedic medicines. This factory is situated at a distance of 3 km on the Ranikhet Ramnagar Road. It has a nursery of medicinal herbs and shrubs. One can buy Ayurvedic medicines, especially high quality Chyawanprash from here. Tarikhet is situated about 8 km from Ranikhet. This place is famous for the Gandhi Kuti, a small hut in which Gandhiji once stayed, and the highly venerated temple of Golla Devta. Bhagirath Pandey and his associates had started the non-cooperation movement in this region by establishing the Prem Vidyalaya, which was visited by Gandhiji in 1929. Sitlakhet is situated about 26 km from Ranikhet. Sitlakhet offers more spectacular views of the Himalayas. It is full of lush orchards and also well known for its herbal and medicinal plants. The Syahi Devi Temple and Khoont, the ancestral village of freedom fighter Pandit Gobind Vallabh Pant are also situated here. The Dunagiri mountain is situated about 52 km from Ranikhet and 14 km from Dwarahat. Dunagiri is known for the famous temple of Durga. It is believed that the bronze plate in the temple dates back to 1181 A.D. This temple stands majestically on a hilltop and attracts a large number of pilgrims every year. Dwarahat is situated about 35 km from Ranikhet on the Badrinath road. It was the seat of the Katuri Dynasty in the 16th century. The town has a cluster of old temples decorated with sculptures. The Syalde Bikhoti Mela is also held here annually. Nearest airport is at Pantnagar (Delhi ) 110 km away and is under renovation. Nearest railhead is Kathgodam at a distance of 86 km from Ranikhet. Ranikhet express leaves Old Delhi Railway Station at 10:40 pm (time as per railway schedule. Check before planning the journey) and reaches Kathgodam early morning (approx 6 am). From here one may hire a full cab or share a cab to reach Ranikhet in approx 2 hours. For assistance on hiring cab/train ticket please feel free to call us. Rishikesh, also known as the 'place of sages' is Haridwar, at the confluence of the Chandrabhaga and Ganga. It is believed that God by the name of 'Hrishikesh' had appeared as an answer to the hard penances by Rabhiya Rishi and henceforth the place derived its name. It is the starting point for the Char dham pilgrims but also for the people who are interested in meditation, yoga and other aspects of Hinduism. This is an ancient temple dedicated to Shatrughan, Lord Ram's brother and is situated 5 kms. away from Rishikesh. The Neelkanth Temple is situated on top of a hill across the Ganga. According to mythodology, after the Sagar Manthan Lord Shiva drank all the effluent venom here, which turned his throat blue, hence the name Neelkanth. Eveningaarti of Goddess Ganga is performed at Triveni Ghat. Triveni is a bathing Ghat where people wash their sins by taking a dip in the holy water of sacred Ganga River. It is believed that the three streams of Ganga, Yamuna and Saraswati are flowing together underground at this point.Pinda Shradhais also performed at Triveni Ghat. Rishikund literally suggests the sage's pond. It is believed that the waters of the Yamuna drenched this pond on the request of Kubz saint. Shani mandir is also situated at Rishikund. Rishikesh is 230 km north of Delhi and is well connected by Road from nearby cities. Regular state transport buses are available from Delhi's Kashmere Gate ISBT. The convenient rail head is at Haridwar, 25 km away. Rishikesh has a railway station too.